Do you shun the sun and run for the shade or slather on truckloads of sunscreen when outdoors? There is a good chance that this might be making you vitamin D deficient. Worldwide an estimated 1 billion people have inadequate levels of vitamin D in their blood, states a data by Harvard School of Public Health. Vitamin D deficiency raises your risk of suffering from serious diseases like cancer, cardiovascular disease, osteoarthritis, multiple sclerosis, type 1 diabetes, depression, and more. This makes it all the more important to get your dose of vitamin D.
Vitamin D is primarily obtained from skin exposure to UV radiation in sunlight. If you are not getting enough sunlight, get your dose of vitamin D from foods like oily fish, beef liver, egg yolk, fortified orange juice, veggies and berries or vitamin D fortified foods. However, nothing can replace sunshine. Few foods naturally contain vitamin D, and fortified foods are often inadequate to satisfy either a child’s or an adult’s vitamin D requirement. Who is at Greater Risk of Vitamin D Deficiency? Research suggests vitamin D deficiency is most common in adults who mostly stay indoors or in those who always wear sun protection. People with darker skin as darker the skin, the more vitamin D your skin may need than fair-skinned people. People above 70 years, as the older you get, the lesser the ability of your skin to produce vitamin D.
Those who live in places where there are longer periods of darkness. As the signs and symptoms of vitamin D deficiency are nonspecific, it is often tricky to diagnose the condition. 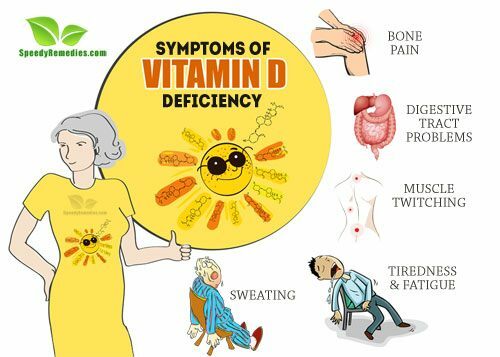 Sometimes symptoms of vitamin D deficiency are often misunderstood with fibromyalgia or chronic fatigue syndrome. So how do you know whether you are loading up on enough of vitamin D? Vitamin D maintains blood calcium levels and it regulates calcium and phosphorus, which keep bones hard and strong. Deficiency of this vitamin causes osteopenia (weak bones) and intensifies osteoporosis (decreased bone density causing brittle bones). In both these conditions, there is an increased risk of falls and fractures. According to a 2003 study published in the Journal of Bone and Mineral Research, vitamin D supplementation can improve muscle strength and reduce fall frequency by approximately 50%. Women over 30 have the biggest risk of developing vitamin D deficiency, thereby raising their chances of developing bone osteoporosis. Estrogen, a hormone in women that protects bones in women, reduces sharply after menopause that causes bone loss. Not only women, vitamin D deficiency is also common in young adults including men. Vitamin D deficiency can cause rickets in children, a disease that result in soft and weak bones. If you have a serious vitamin D deficiency, you might have difficulty in moving around as you might experience bone pain and muscle weakness. The killer cells of your immune system – T cells – detect and kill viruses, pathogens, bacteria that cause infections in your body. For T cells to destroy foreign pathogens, it needs to be transformed from inactive and harmless immune cells to killer cells. And this can only happen with the help of vitamin D.
According to a study published in the Journal of Nature Immunology in 2010, vitamin D is crucial to activate your immune defences. Without sufficient amount of vitamin D, the killer cells of the immune system will not be able to fight off serious infections in the body. Fatigue is a state of tiredness or low energy. It has significant effects on your social life, family life, and work performance. In most of the cases, the reasons for fatigue are varied. However, research suggests that vitamin D deficiency is linked with fatigue. According to a 2014 study published in the North American Journal of Medical Sciences, correction in the levels of vitamin D improves fatigue. So, if you are constantly tired and exhausted, get your vitamin D levels checked. Vitamin D aids in the production of serotonin, the brain hormone associated with mood elevation and happiness. Increased levels of serotonin can reduce stress and prevent mild depression. A deficiency of vitamin D can lead to mood swings. According to a 2013 study published in the British Journal of Psychiatry, low vitamin D concentration is associated with depression. Another 2014 study published in Journal Medical Hypotheses suggest that people suffer from mild depression, known as SAD, in winter months due to lack of sun exposure. Thus, those feeling depressed should try to spend some time in the sun daily if possible. Vitamin D receptors are present on cells in your digestive tract and immune system. Vitamin D binds to these receptors and helps your body and digestive tract to function properly. This explains why when you suffer from a gastrointestinal condition; your body may not be able to absorb vitamin D, leading to its deficiency. According to a study published in BMJ Open Gastroenterology in 2015, out of 51 irritable bowel syndrome patients tested, 82% exhibited insufficient vitamin D levels. Gastrointestinal conditions including inflammatory bowel diseases, Crohn’s, celiac, colitis are caused due to infections, parasites, bacteria in your gut. These diseases develop when good bacteria in the gastrointestinal tract are low and are unable to keep these infections at bay. Good bacteria need vitamin D to thrive. When there is vitamin D deficiency, the good bacteria is replaced by the unhealthy bacteria. Hypertension or high blood pressure is a condition in which blood flows through the blood vessels with a force greater than normal. It increases the risk of heart attack, stroke, kidney problems etc. Hypertension may indicate a low Vitamin D level in your body. This vitamin suppresses the enzymatic process that can constrict the arteries and lead to high blood pressure. In addition, vitamin D improves blood circulation throughout the body, which is essential for your heart to function properly. This helps in reducing the risk of heart problems, stroke and other problems. According to a study presented at the European Society of Hypertension in 2012, vitamin D supplementation in winter can lower blood pressure in patients with hypertension. The study states that many Europeans have low levels of vitamin D, especially during the winter months when there is less sunshine. Vitamin D deficiency has been linked to respiratory disorders like asthma, upper and lower respiratory tract infections, pneumonia, tuberculosis, and more. The deficiency of this vitamin has also been linked to increased risk of developing flu. According to a 2014 study published in the Journal Lancet Respiratory Medicine, vitamin D supplements can reduce Chronic Obstructive Pulmonary Disease (COPD) flare-ups by over 40 percent in patients with a vitamin D deficiency. COPD include conditions such as chronic bronchitis and emphysema. Flare-ups of these conditions can also lead to hospitalisation and even death. One of the classic signs of vitamin D deficiency is a sweaty head. Excessive sweating in newborns can be due to neuromuscular irritability, which is an early symptom of vitamin D deficiency. Neuromuscular irritability causes your nerves and muscles to twitch. This is one of the reasons why doctors inquire new mothers about a condition of head sweating in their newborns. Also, vitamin D deficiency can cause rickets, a condition of brittle bones in children. Vitamin D regulates the concentration of minerals that regulate your body’s fluid balance, thereby regulating your body temperature. Muscle twitches or spasms occur when your muscles contract. Twitches are usually short lived and can be painful. Muscle twitches may occur due to vitamin D deficiency. In addition to muscle twitches, when you have a vitamin D deficiency, you may experience muscle cramping and tingling sensation in your extremities. If your body is low on vitamin D, your body cannot absorb sufficient amounts of calcium and phosphorus in your blood. You need this vitamin to promote healthy bone development and muscle movement. A severe deficiency in vitamin D can cause a condition called tetany that is accompanied by hand and facial spasms.